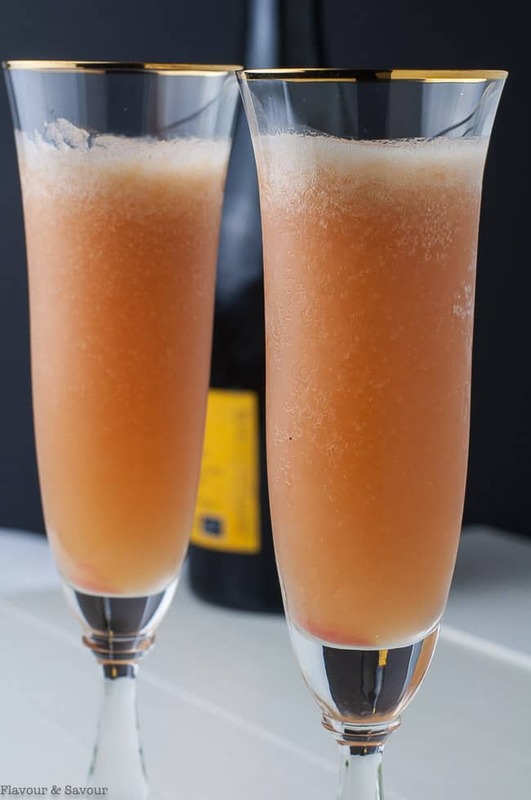 Celebrate warmer days with a refreshing, fun and fizzy Rhubarb Bellini Prosecco Cocktail! After a long dreary winter of rain, rain and more rain, we are more than ready to celebrate Spring. 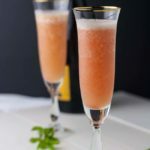 And with rhubarb sprouting in the garden, a glass of this Rhubarb Bellini Prosecco Cocktail is the perfect way to toast the arrival of warm weather! It’s a light and bright bubbly cocktail, delicately pink, with just enough sweetness to counteract rhubarb’s tart flavour. I made this for my sisters-in-law as a pre-dinner drink after a beautiful hike to a stand of old growth forest near where we live. We were hot, tired and thirsty, and this cocktail went down easily! 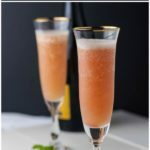 I’m not a fan of sweet cocktails, usually opting for a simple glass of Sangria, so this Rhubarb Bellini was a perfect fit for me. It has a delicate sweetness, mostly from the Prosecco and a little from the rhubarb compote used as a base. 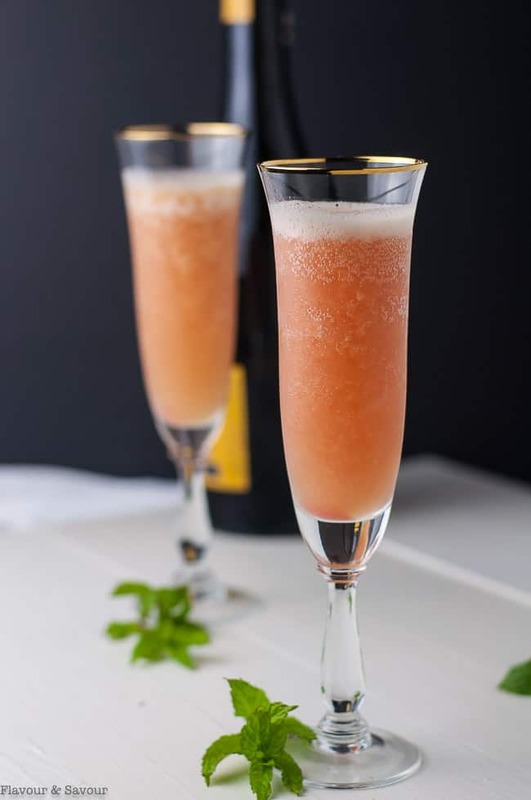 This Bellini is lower in alcohol than most cocktails making it perfect for a brunch or a picnic. 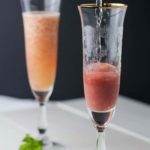 This Rhubarb Bellini is the easiest cocktail you’ll make all summer! 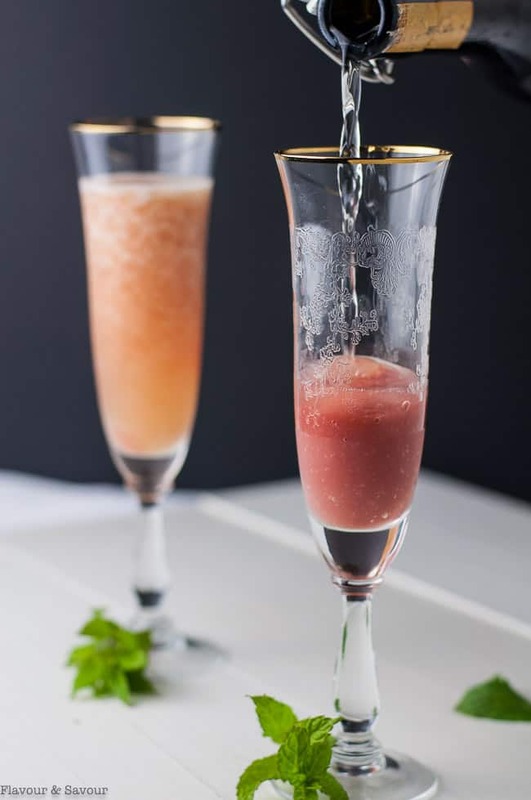 Take 15 minutes to make some rhubarb compote from fresh or frozen rhubarb, cool, then spoon a couple of tablespoons into a champagne flute or cocktail glass. Fill with Prosecco and serve. That’s it! Unless you’re serving a crowd, you’ll have rhubarb compote left over. Store it in the fridge and use it to make this Strawberry Rhubarb Smoothie or Skinny Strawberry Rhubarb Parfait, or spoon it over a simple Lemon Ricotta Cake. You’ll be glad you made extra! I chose to keep this drink simple, but you can embellish it by adding some other flavours to the rhubarb compote. 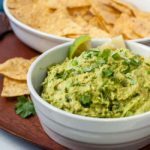 Try a touch of cinnamon or a hint of lemon or orange zest. 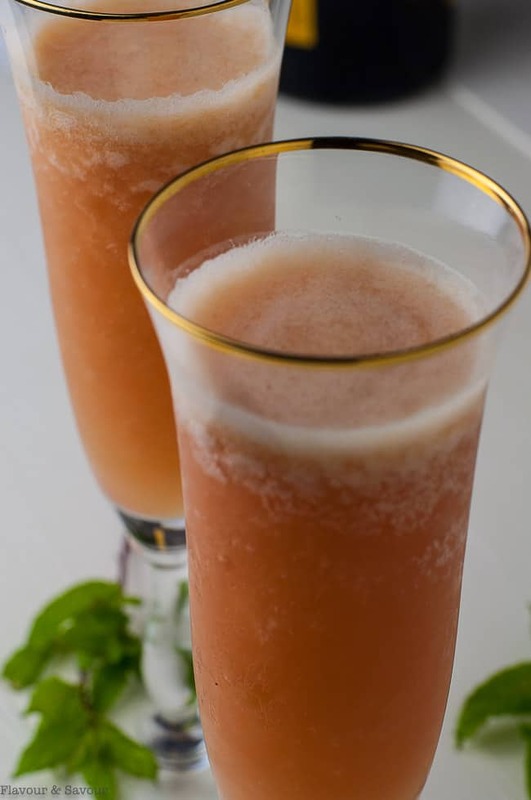 The original Bellini was made with Prosecco and puréed white peaches. It was invented in 1948 and served in the famous Harry’s Bar in Venice, Italy. Cheers! Here’s to a warm and sunny Spring and Summer! To make rhubarb compote, put 2 cups chopped rhubarb stalks in a medium pot with 3 tbsp water and 2 tbsp maple syrup. Stir and bring to a boil. Reduce heat and simmer for 15-20 minutes until tender. Purée in a blender and store in the refrigerator. Spoon 3 tablespoons of rhubarb compote into each of 2 champagne flutes or cocktail glasses. Slowly fill glasses with Prosecco. 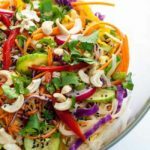 It may bubble up, so add a little at a time to prevent it from overflowing. Use leftover compote in Skinny Strawberry Rhubarb Parfait or Strawberry Rhubarb Smoothie. 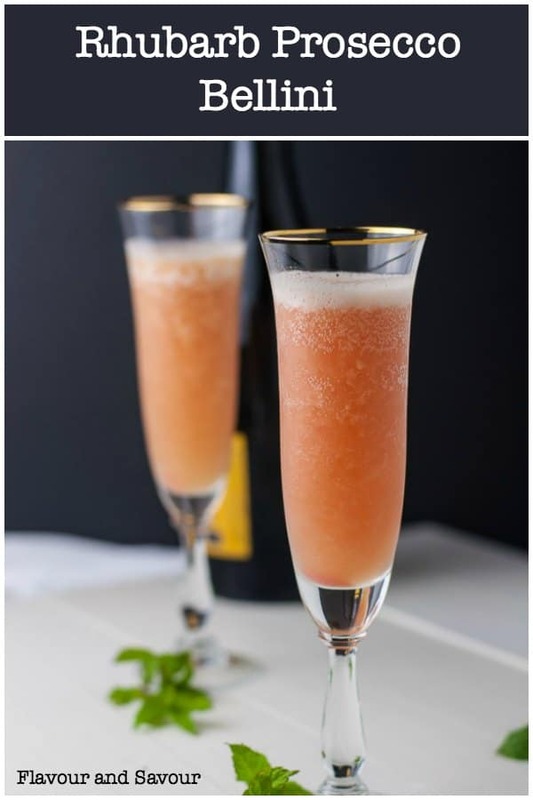 This bellini looks so elegant! And I love the addition of rhubarb. Perfect beverage to serve at a Mother’s Day brunch. Have a great week Elaine! It turned out looking quite pretty and pink! All the best to you too, Leanne. 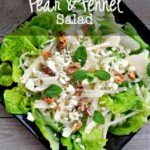 This definitely is the perfect way to celebrate spring and warmer weather! I love that there is leftover rhubarb compote… I would put that on everything 🙂 Cheers! And I do! Thanks Lizzy. Sounds delicious! My rhubarb is up and growing strong so I’ll give this a try very soon. Such an excellent use of rhubarb! What better way to say sayonara to the long rainy winter than with an elegant drink like this. Well, that cocktail certainly looks delicious, Elaine. 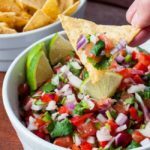 I love the idea of making the compote for the base of this beverage and that it is also so versatile for other uses. During rhubarb season, I like to have some rhubarb compote in the fridge so it’s ready to use for other things, too. Love rhubarb! Looks so elegant! Prosecco and rhubarb is quit a good mix. I’ll try this soon! Hope you get a chance to try it soon!